Although the handsome frog pictured here is made of wood, if you are using the plant stake only indoors, why not try green fun foam instead? Use glue, instead of nails, to fasten a stake to the frog. 1. 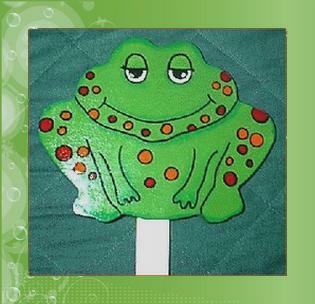 Print and cut out our free frog pattern and use it to trace the design onto your wood or fun foam. Cut out the pattern using scissors for the craft foam or a wood saw (don’t forget to wear your eye protection). If using wood, sand all the sides, top and bottom, then wipe off surface with a rag. 2. Cut a stake that is 1- 1/4 inches wide and 12 inches long. You could use part of a broom handle, or even an old wooden ruler for the stake, as I did. Cut the bottom of the stake at an angle so it will be easy to insert in the dirt. 3. Nail the stake to the center back of the wooden frog, extending it to approximately the middle of the frog’s height. If using fun foam, simply glue the frog to the stake. Color the entire frog spring green and let dry. Color the circles in Pure orange and Napthol crimson. Use Holly leaf green for highlighting the edges of the frog, under his chin and where his limbs are in the front. 6. When all the paint is dry, take a permanent black marker and trace around the frog’s spots and chin, smile and eyes and front limbs. Lastly, for the wooden frog, spray or brush on an outdoor sealer. Enjoy!